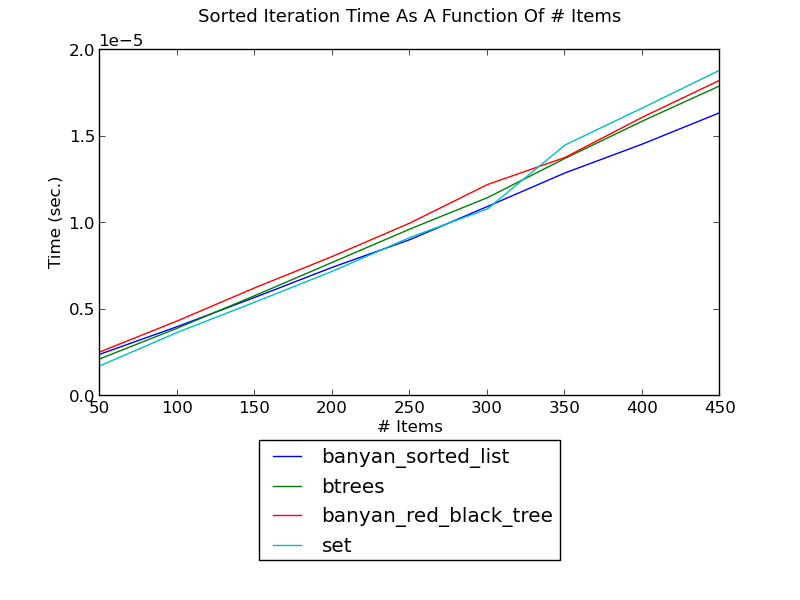 The next table gives the well-known asymptotic running times of various operations using different mapping algorithms. Using such a table, together with experimentation, the appropriate algorithm for each setting can be found. 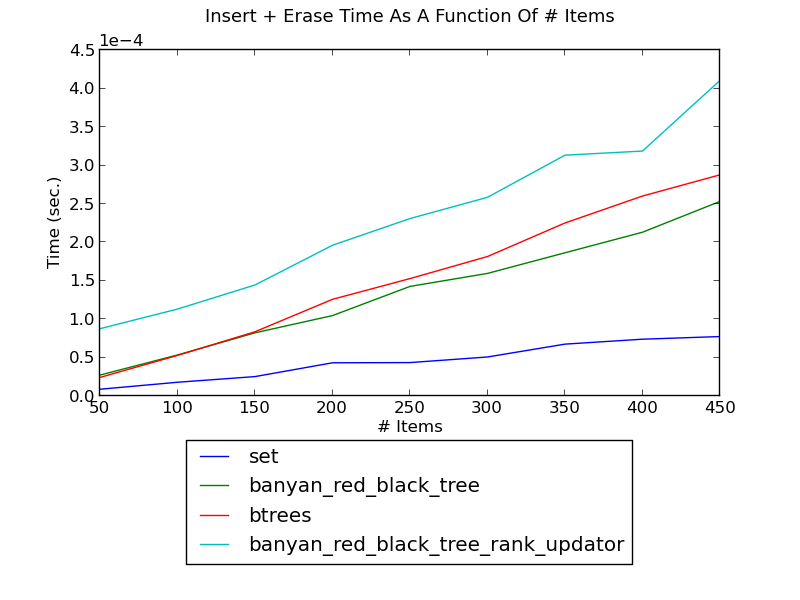 bintrees - A bintrees.FastRBTree (V 1.0.1) red-black tree. hash-based containers work best if it isn’t. red-black tree based containers seem to work best if it is. There are some specialized cases where other tree-based containers are better. From the table above, it is apparent that hash-based containers are basically O(1) on lookup/insertion/removal operations, whereas trees are basically O(log(n)). 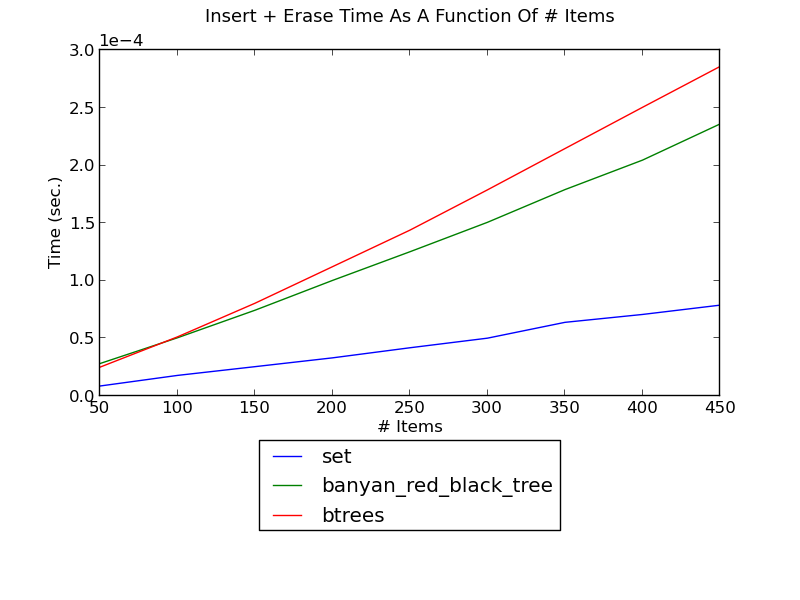 Conversely, iterating in order over a hash-based container is generally O(n long(n)), wherease trees are O(n). 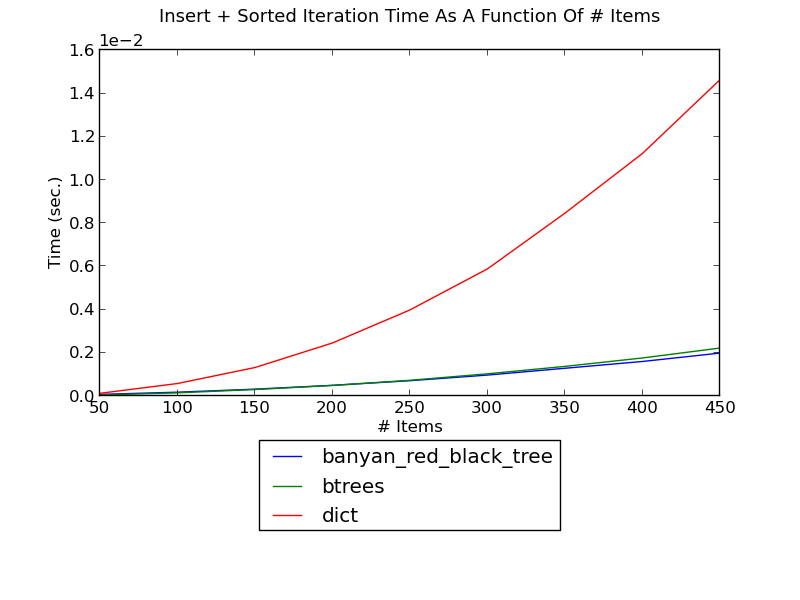 Thus, if a combination of modifications and sorted iteration is required, trees are a good choice; otherwise, a hash-based container is a better choice. Hash-based containers are not very well suited for combinations of modifying containers and iterating over their items in sorted order, even if the iterations are relatively infrequent. 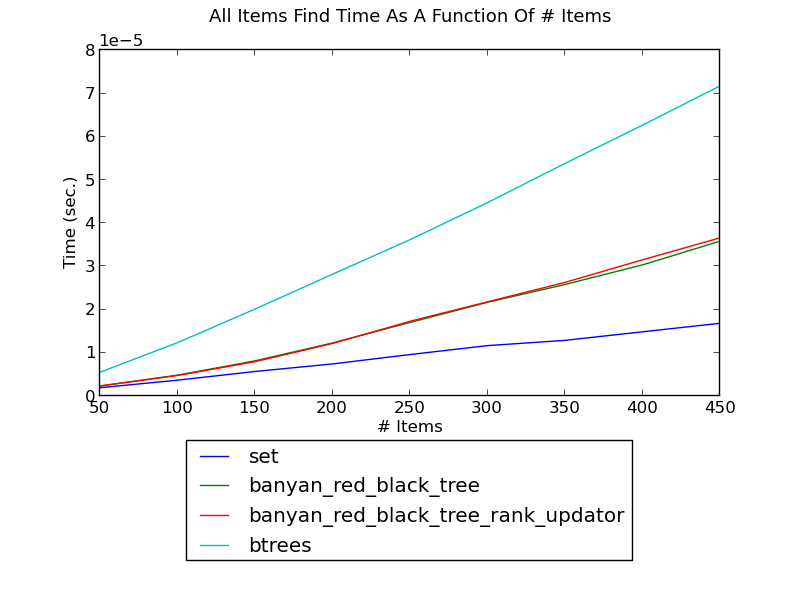 Without sorted iteration, for simple lookup or modification, the situation is reversed: hash-based containers do better than tree-based containers. 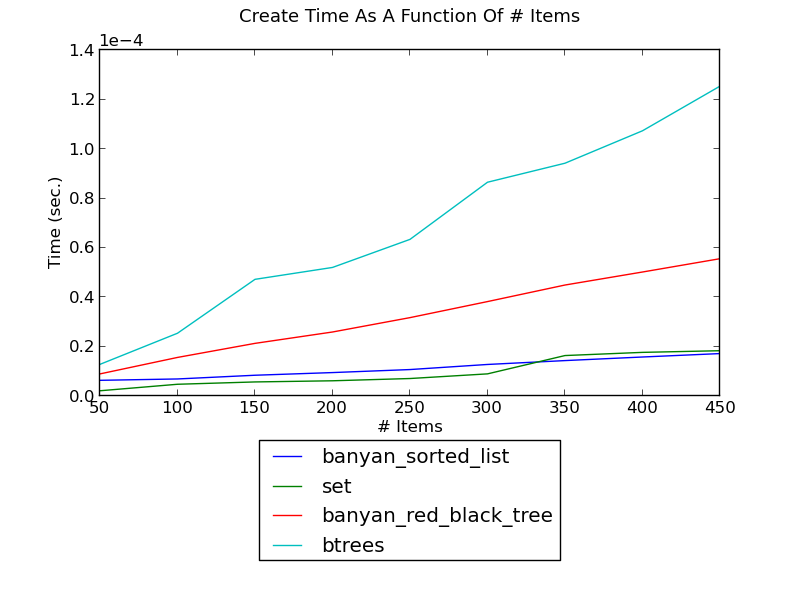 Sorted lists are just about the most memory-efficient mapping containers possible. In addition, they are well suited for non-modifying operations: creation, lookup, and iteration; from the table above it is apparent that they are far less suited for modifying operations. 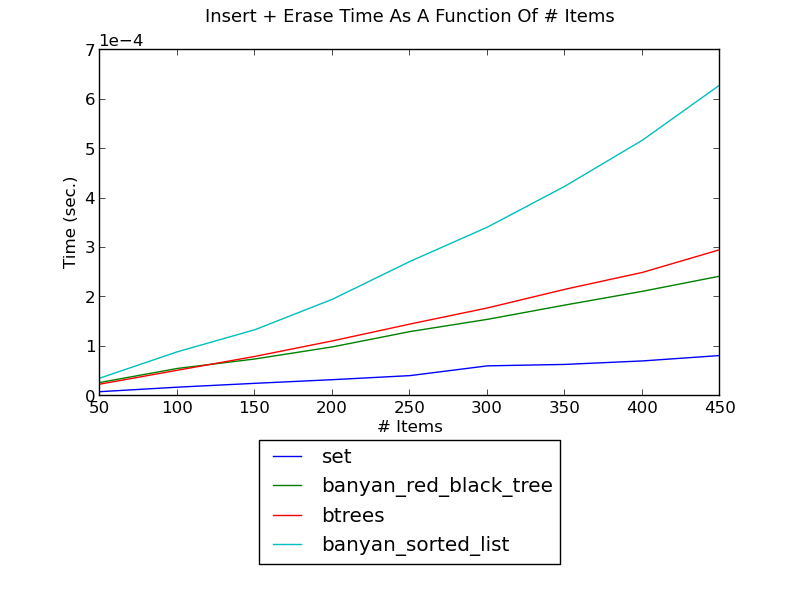 banyan.SORTED_LIST is the default algorithm for banyan.FrozenSortedSet and banyan.FrozenSortedDict, but this algorithm might also be appropriate for cases where updates are allowed, but are relatively infrequent. In some settings, keys are accessed completely randomly. In other settings, at most time periods, only a small set of keys is access. 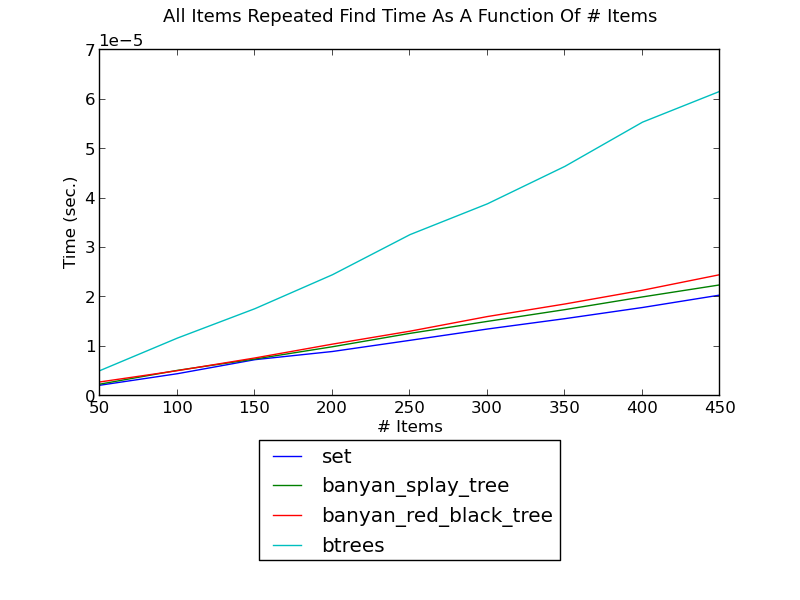 In the latter settings, splay-based trees have some advantages. 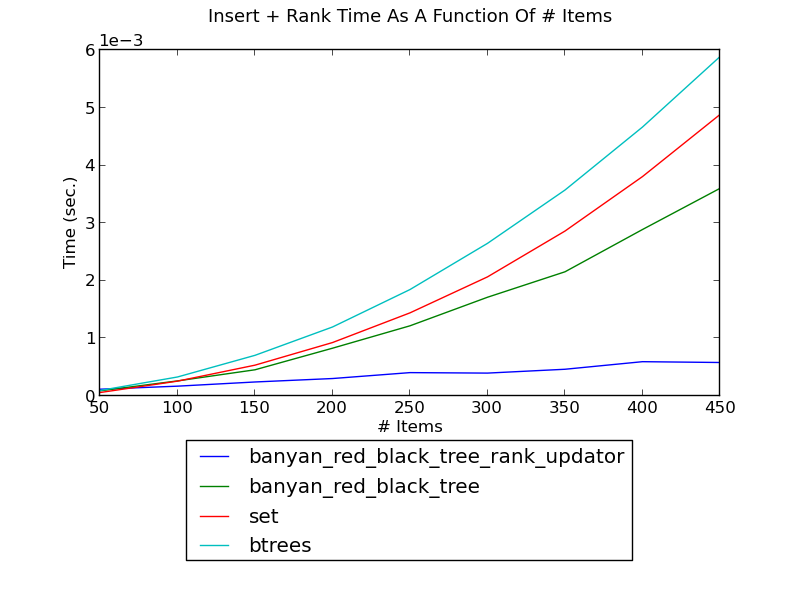 In the former settings, they do not balance trees as well as red-black trees, and, more importantly, they require about twice as many comparisons per search. 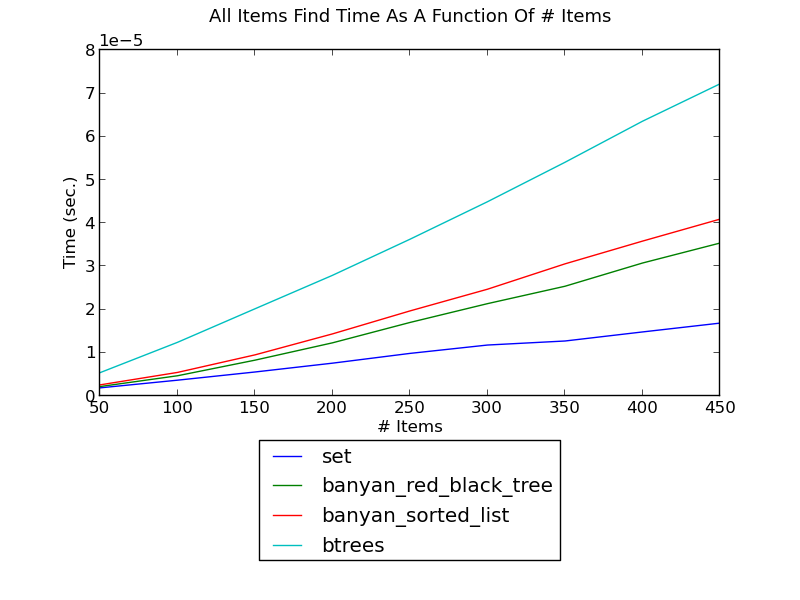 Naturally, tree-based containers are efficient for operations pertaining to specific key ranges, but the appropriate methods need to be used. 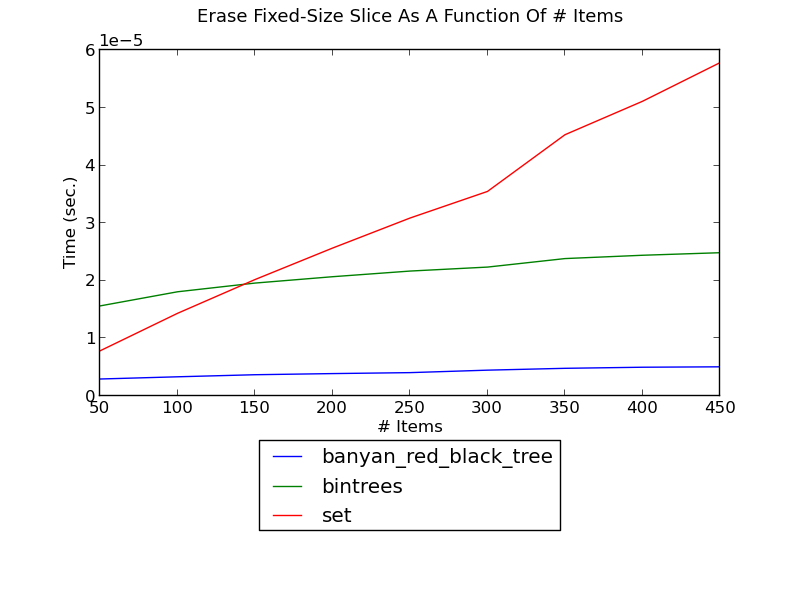 which performs some logarithmic operations for finding the range boundaries, and iteration over the slice. Trees can be augmented to support new functionality efficiently (see Augmenting Trees for a detailed explanation). 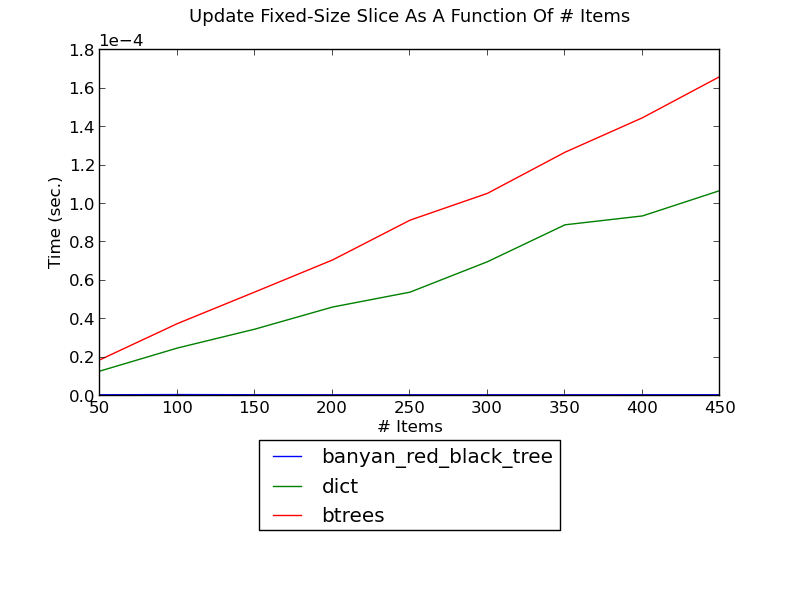 bx is a package dedicated towards these types of operations, and Banyan uses an updator on a regular red-black tree. 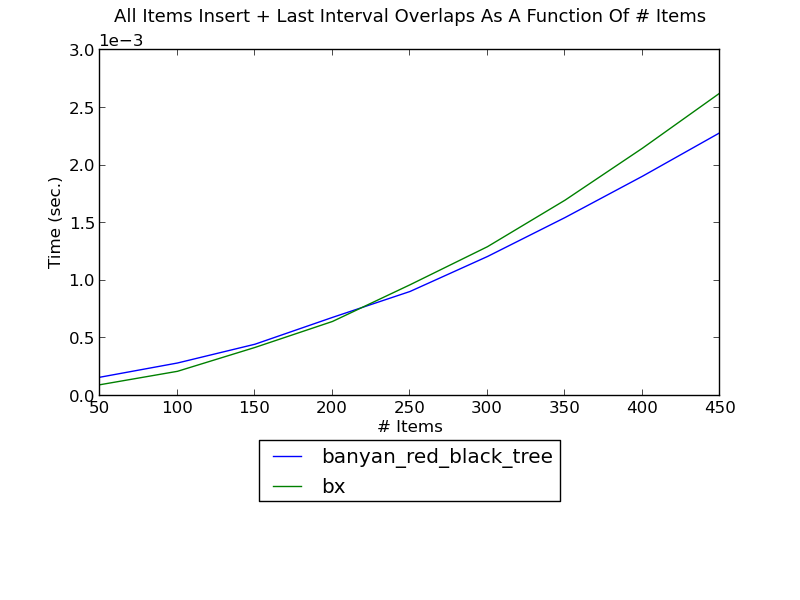 If k intervals overlap an interval, the complexity of finding them using either implementation is only k log(n). 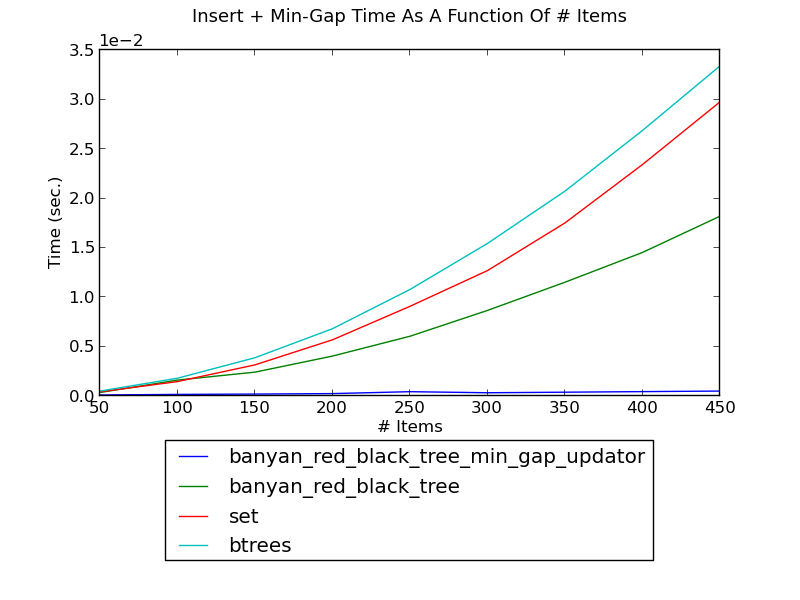 The following figure shows the running time of inserting integers one by one into a set and, and finding the minimum gap of the inserted integers in the set after each insertion, as a function of the number of integers (see _set_insert_min_gap.py for the source). Augmentation does not alter the running time of non-modifying operations (e.g., __contains__), and while it does not change the order of growth of modifying operations, it adds a multiplicative factor. 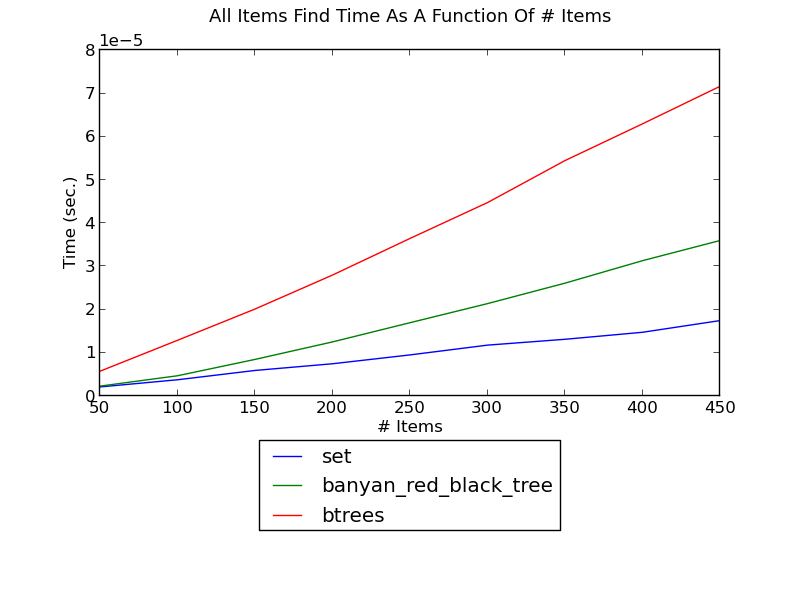 For the predefined classes, the multiplicative factor is small. 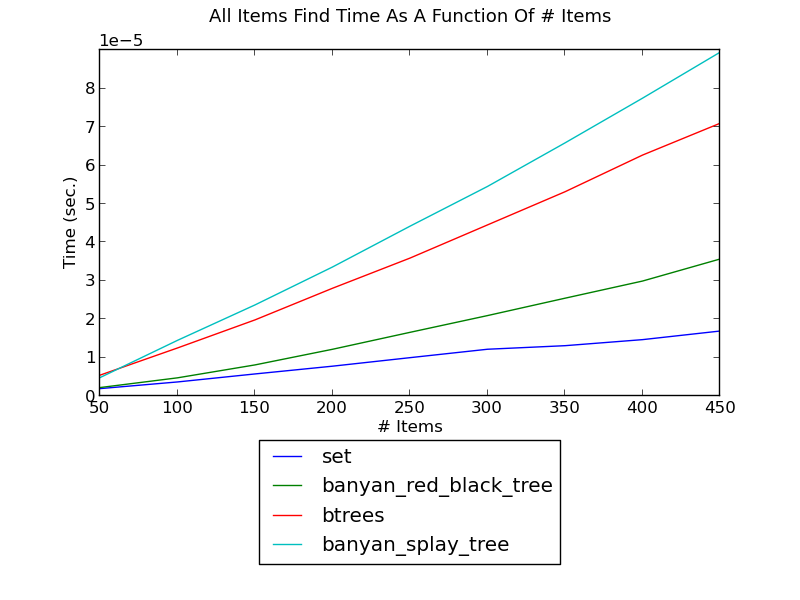 Due to the dynamic nature of Python, however, pure-Python augmentation incurrs a significant multiplicative factor, and is therefore primarily useful for very large trees. © Copyright 2013, Ami Tavory. Created using Sphinx 1.1.3.